The late Afro-Brazilian scholar Abdias do Nascimento set a unique flame to Brazil’s quilombos, or maroon colonies, which had been established by runaway slaves as well as free people, in many of his writings. He described them as the result of the “vital exigency for enslaved Africans to recover their liberty and human dignity through escape from captivity, organizing viable free societies on Brazilian territory,” and used quilombos as the basis for his ideology of resistance against racial oppression. Nascimento’s writings express admiration for the collectivism and independence characteristic of these communities, which exist nationwide. On June 5, residents of one Bahian quilombo clashed with members of Brazil’s military. The inhabitants of Quilombo do Rio do Macaco drew media attention as officials from the Aratu Naval Base encroached on the community’s fringes. Residents were deprived of access to basic resources such as electricity and potable water, while Navy officials restricted travel to and from the quilombo. Unsurprisingly, the community has yet to be officially designated a quilombo by the Brazilian government, preventing inhabitants from living there as free quilombolos, or inhabitants of quilombos, according to Articles 215 and 216 of the 1988 Brazilian Constitution. Current residents of Rio do Macaco are generally the third or fourth generations to call this area of Bahia home. A video released by a sympathetic blog following the conflict, titled “Bahia na Rede” (Bahia on the Net), emphasizes the quilombo’s unique history as an autonomous community and claims to the land. (3) One resident speaks of how his parents, grandmother, and great-grandmother were born in Rio do Macaco. Another woman in the video traces her ties to the community centuries back, referencing her grandmother of 111 years of age. Despite the inhabitants’ compelling histories, however, officials defend the base’s existence. The Navy maintains that the base was constructed for the sole purpose of “logistic support for the naval, air, and marine forces of the Brazilian Navy stationed at Aratu or in transit.”(4) Many military officials continue to deny any future plans for unlawfully dislocating additional residents. 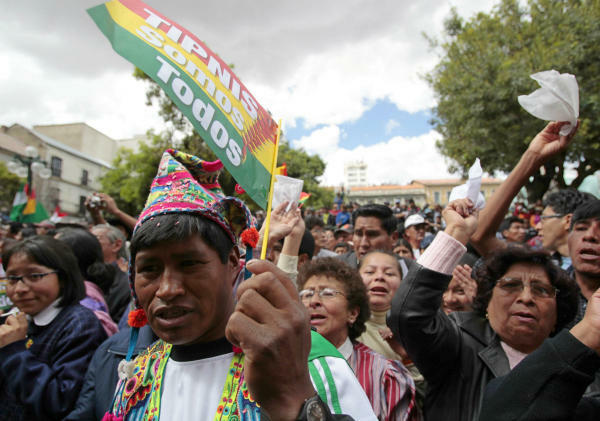 Support from NGOs and independent human rights activists have postponed the repossession of these territories until August of this year, thereby offering quilombolos ample time to develop their own case before the public. 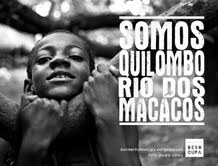 Organizations such as the Palmares Foundation and the National Institute of Colonization and Reform (INCRA) support the community and declare Rio do Macaco a rightful quilombo under the 1988 Constitution. 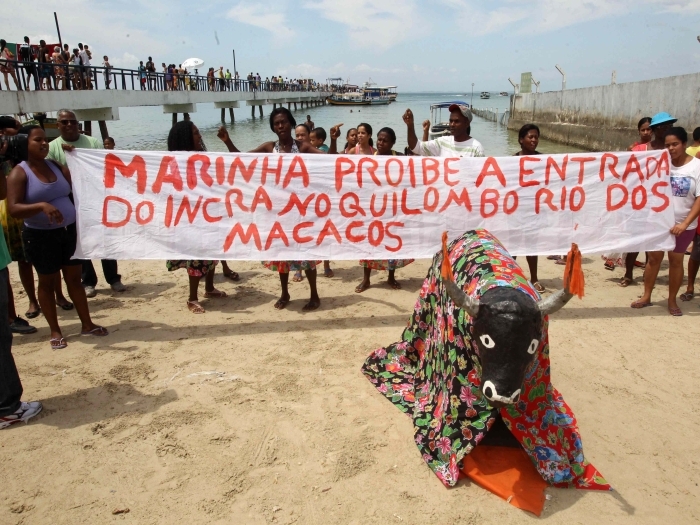 Consequently, residents of Rio do Macaco can now submit pleas for official government recognition and invoke Article 215 of the Constitution, which specifically protects indigenous and Afro-Brazilian land rights. Without official government recognition of the quilombo, residents are virtually hopeless in the face of military oppression. On June 4, Guellwar Adun, an apologist for the quilombolo cause, posted a series of photos on Bahia na Rede. 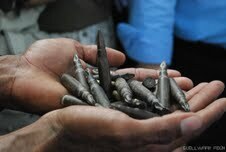 These photos include portraits of the local community and highlighted bullets that farmers found near the village. An accompanying post said, “What we see here is a shame for a nation that aspires to democratic ideals. We must act so that our government will respond!”(7) Unattributed text also referred to controversial policies whereby marines prevent any construction in the community that they have not authorized. Federal Judge Evandro Reimão dos Reis of the 10th circuit in Bahia supported these claims, and prohibited construction in the territories comprising Quilombo Rio do Macaco. 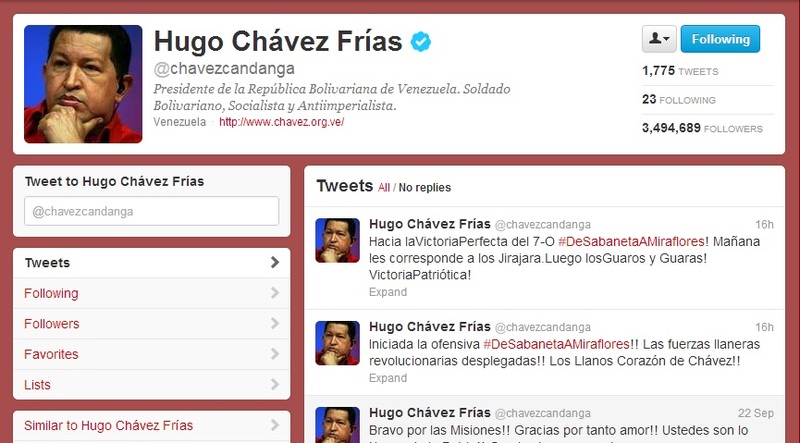 (8) These policies culminated in the events of May 28, which quilombolos have used as a new focal point for their protests. According to Bahia na Rede and Cedefes, armed militants invaded the quilombo and prevented the reconstruction of resident Jose de Araujo’s home. Their violent tactics and complete disregard for residents’ rights reveal the roots of the widespread panic prevalent in this part of Bahia. Other violations include seizure of the local postal services and regular intimidation by armed officials. More specifically, representatives for INCRA blame the Navy’s austere travel restrictions to and from Rio do Macaco on the civilian residents’ inability to effectively develop their case. Inhabitants are often prevented from leaving the territory to plead their case and supportive organizations are prevented from breaching the base. Earlier protests pleading for assistance have finally garnered attention. More recently, representatives for the Committee of Human Rights (CDH) and the Minority of the Chamber of Deputies in Bahia have arrived to investigate the case. In Rio do Macaco, committee members heard the case of quilombolos in a public forum, accompanied by several other important government and NGO officials. To date, no official resolution has been reached, although the CDH has tried to facilitate dialogue between the military and locals of Rio do Macaco. Representatives also have pointed to the culpability of the Attorney General’s Office regarding the conflict, especially for hearing the apparently unjustified claims of the military. By contrast, the military insists that residents are exaggerating their case. Commander Queiroz has argued once more that it is conventional for marines to carry out armed patrol, given it is a military base. Although no official calendar has been made, some Navy representatives have expressed plans to convert other territories comprising the Rio do Macaco zone into residential buildings and a hospital for marines. (12) Certainly, these projects would demand the relocation of the 500 quilombolos of Rio do Macaco. (13) The relocation of these people is not a viable option, however, and they are not yet willing to leave. Quilombolos of the Rio do Macaco region have lived there for more than a century, and have laid claims to the land long before the arrival of the military. If nothing else, one possibility would be for the Navy to abandon the base and return appropriated territories to these people. In essence, this is very much a humanitarian issue. Critics insist that the military has robbed these people of their rights as citizens, and Brazil’s sluggish judicial system has allowed officials to take advantage of the community’s uncertain legal status. As long as Rio do Macaco retains this liminal status, Marines will almost certainly continue to encroach on these territories and ultimately force these marginalized groups from their land. As Brazil continues to democratize, the government should take stronger measures to defend the rights of its citizens against endemic military aggression. This is especially crucial when it comes to historically oppressed populations. Attacks on rural populations such as those dwelling in Rio do Macaco constitute violations of constitutional rights and ought to be prosecuted as such. The matter deserves greater international media coverage so as to pressure the Brazilian government to take action on behalf of quilombo communities.